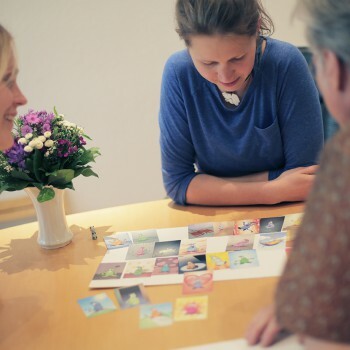 In mediation, the Gefühlsmonster® cards can help make differences in people’s experiences clear and tangible. The severity of an experienced or current feeling is much more comprehensible as an image rather than only as the spoken word. For more user feedback on this particular area of application, try the tag cloud on the right. If you would like to get acquainted with and try the Gefühlsmonster® cards for yourself before working with them, below you will find instructions (PDF) for you to download free of charge. Please click on the settings icon to turn on English subtitles. "What does this card mean for you?" With the Online Emotion Scan you can give the work with the Gefühlsmonster cards a try.